I have just relented and done my Christmas food shopping online for delivery (on Thursday 22nd as all the 23rd and 24th delivery dates had been snapped up). I have a standard list that I have saved on the computer for Christmas food shopping. I roll the same one out every year and add other bits I'll need (so at least I know I won't forget anything). I noticed that there's one particular item that always appears on that list and it's a little sad and lonely looking. 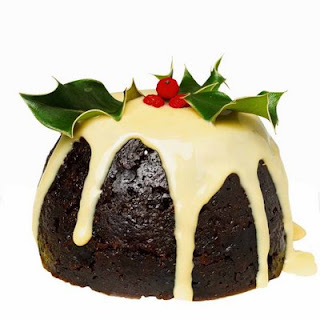 I always buy an individual Christmas Pudding. Just a little one. Why? Well, no one else in the family likes it (freaky people I live with!) and if I buy a big one it just goes to waste (or I end up scoffing the whole thing which, Christmas season or not, is really not good for my waistline!). So I have my little individual Christmas pudding and custard while the rest of the family tuck into very unfestive cheesecake for dessert. The weirdos. I'm happy though, that little bigtof Christmassy goodness tops off my Christmas dinner quite nicely, thank you very much. Yum, yum, yum.